8,000 people will die of Aids today! Are you okay with this? According to the UN, 25,000 people will die today from starvation and malnutrition. Are you okay with this? There are 130,000 kids up for adoption in the U.S. today and millions more kids worldwide without families. Are you okay with this? A child dies from drinking contaminated water every 21 seconds! Are you okay with this? This question can be asked of every suffering and injustice. Are you okay with it? But, here is the problem....most of us ARE okay with it. Obviously. Because many of us are doing nothing about it. Mark Batterson suggests in his new book, "Primal" that "...we are okay with it because it does not have a name or a face. We've never held someone who is starving to death. No one in our family has needlessly died from contaminated water. But once the issue has a name or a face, it changes everything." Well, folks, God knows the names and the faces very well. And it breaks his heart. When will our hearts break for the things that break God's heart? And when will we do something about it? 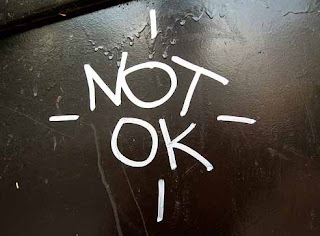 It is NOT okay to NOT do something.